Alder provides a well-written back story of the Lurton wine dynasty. Clear, opaque ruby fading to a pale ruby rim. Clean, youthful, pronounced nose of cassis, smoky oak, dark chocolate and a hint of leather spice. Dry, with balanced acidity and medium-high, slightly coarse tannins. Full-bodied, with an intense palate of ripe black fruits and toasty oak. Medium alcohol and a long length. Good quality Cabernet from Mendoza. Drink now and over the next 3 years. For more WG tasting notes, click here. Will the Real Bonarda Please Stand Up? 'Bonarda' is the most widely planted red grape variety in Argentina. Some experts believe Argentine Bonarda is actually the red variety called, "Charbono," in California (source: Oxford Companion to Wine). Bonarda was brought to Argentina in the 19th centrury by Italian immigrants (source: Bodega Catena Zapata, Argentina). So does Bonarda still exist in Italy? And which of these is the Bonarda brought to Argentina? I'm confused; How about a glass of Bonarda/Corbeau/Douce Noir/Bonarda Piemontese/Uva Rara/Croatina/Charbono? Malbec is a lesser known, supporting member of the Bordeaux cast (which prominently features Cabernet Sauvignon, Merlot, and Cabernet Franc). The humble little Malbec grape has finally found a starring role in Argentina. There are dozens of Malbec producers. 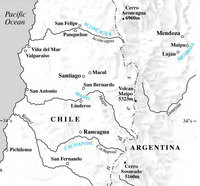 Don Miguel Gascon, in the Mendoza Valley (see map), produces an entry-level Malbec for about ten bucks.